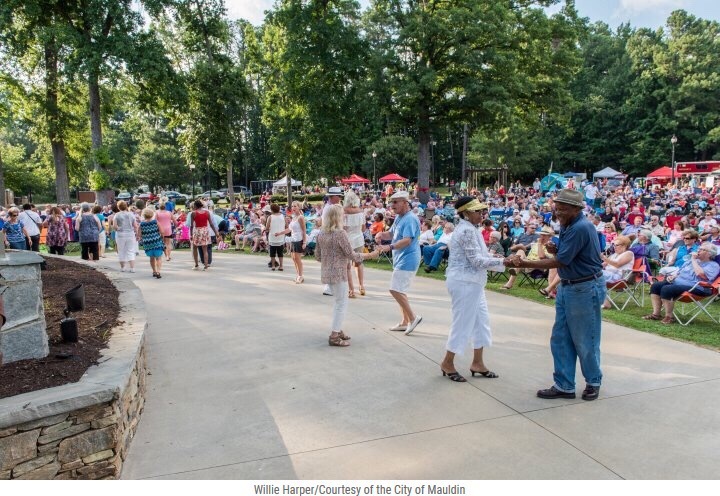 See the Cultural Center events and the City of Mauldin calendar. 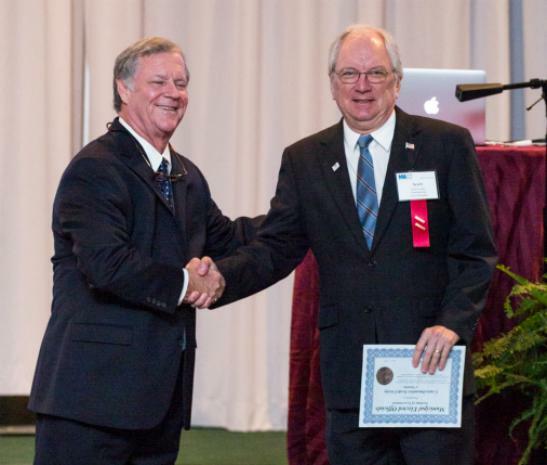 Mauldin City Government works closely with the Mauldin Chamber of Commerce. Visit their website for events and other information as well. five years, resulting in the third highest rate in the U.S. The state has been a big proponent of using incentives to lure foreign investment and U.S. companies alike. 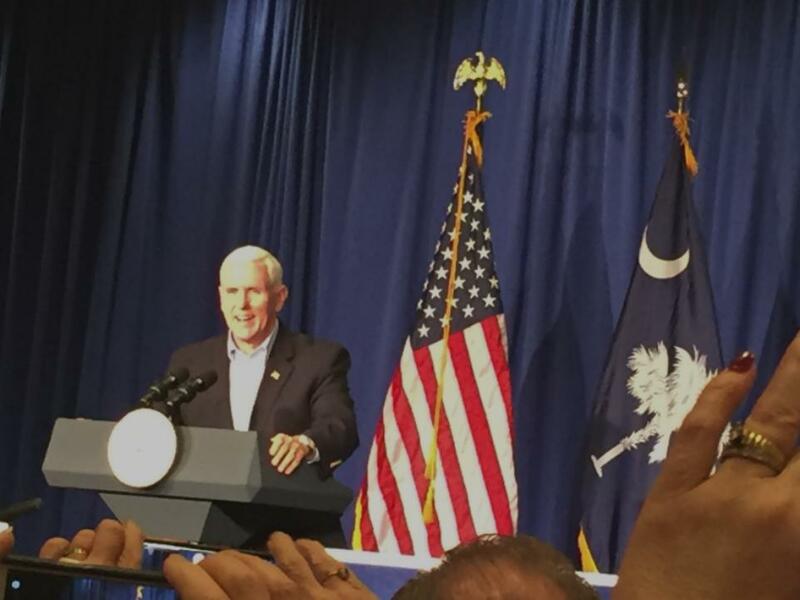 The Palmetto State’s economy also benefits from its status as a right-to-work state. 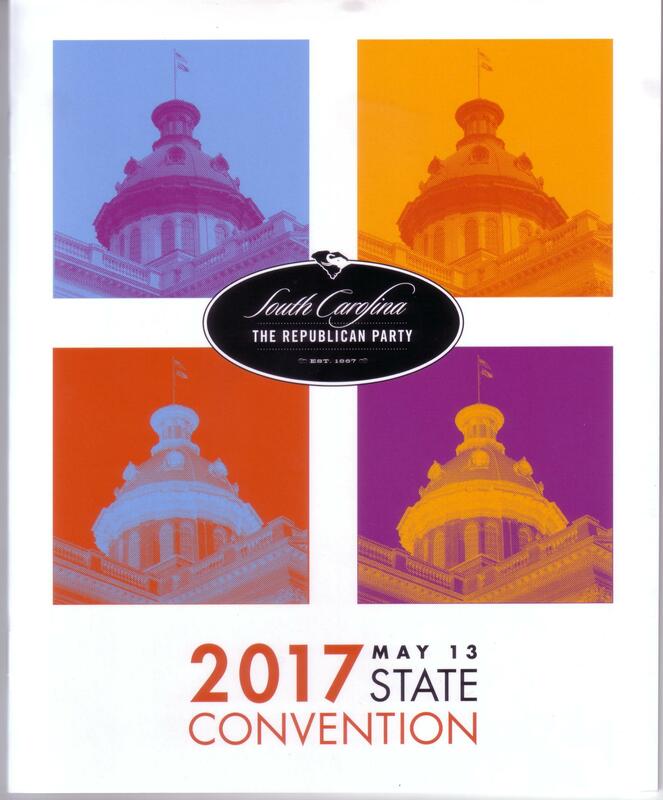 South Carolina has the lowest union membership as a percentage of its workforce in the country at just 2.6%. - hey; that's Red, White, and Blue! Annexation along I-185 near Log Shoals Road. by the Reverend Carl McCluney, of the New Harvest Ministries. The Reverend Carl McCluney has served in the United States Air Force. We are honored by his permission to let us reprint it here. that amongst the continual world threat our freedom still rings. Let us forever remember our freedom, for its Equality for Everyone. 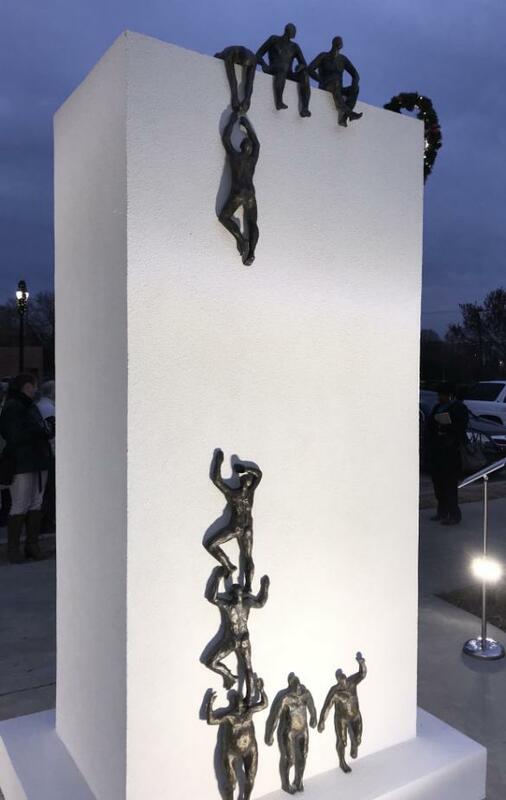 But also by the men it honors, the men it remembers"
See the Cultural Center Arts website for more information. The 2017 Christmas parade - we hope you enjoyed it. A Veteran is someone who makes America a safe place - so much so that some never realize how necessary that is. 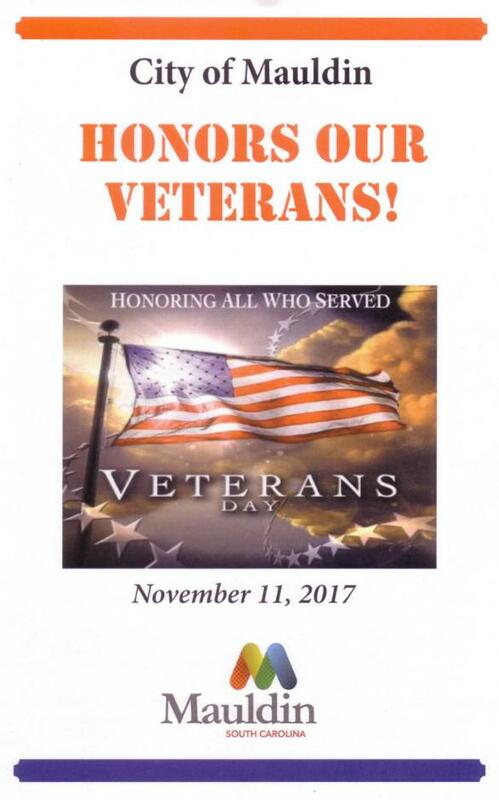 "A Veteran is someone who at some point in his life made a check payable to 'The United States of America' for an amount 'up to and including his life.'" 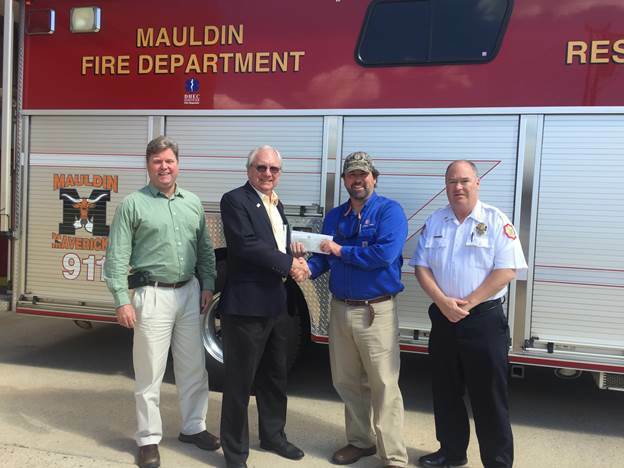 Mr. Brandon Grooms, with Colonial Pipeline, presented a check for $4,800 to the Mauldin Fire Department. This generous donation will help update our air monitoring capabilities for hazardous materials situations. 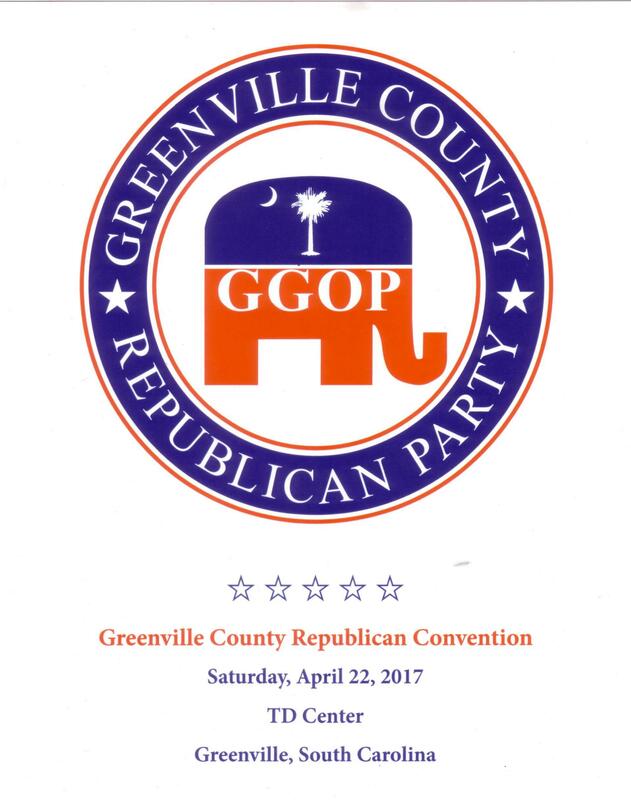 Colonial Pipeline is a great community partner and an active member of the Greenville County Local Emergency Planning Committee. 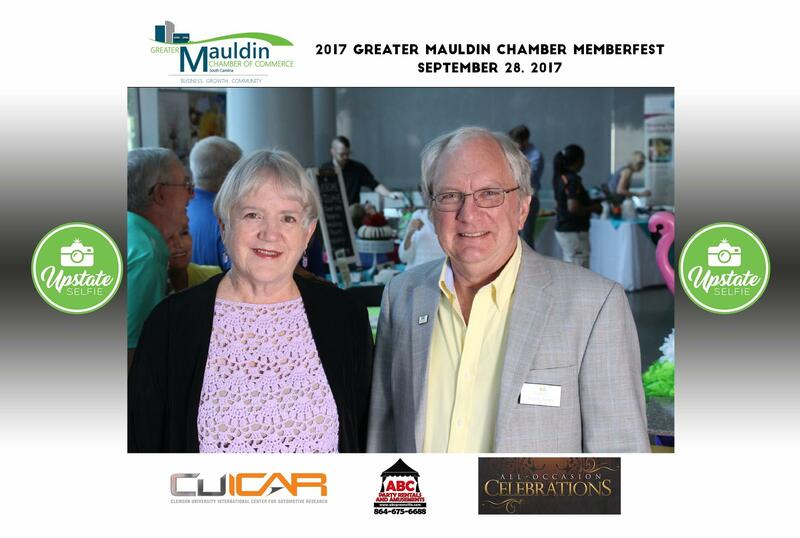 Rhoda and Scott at the 2017 Mauldin Chamber of Commerce Memberfest. ... There is clearly a lot of room for improvement. 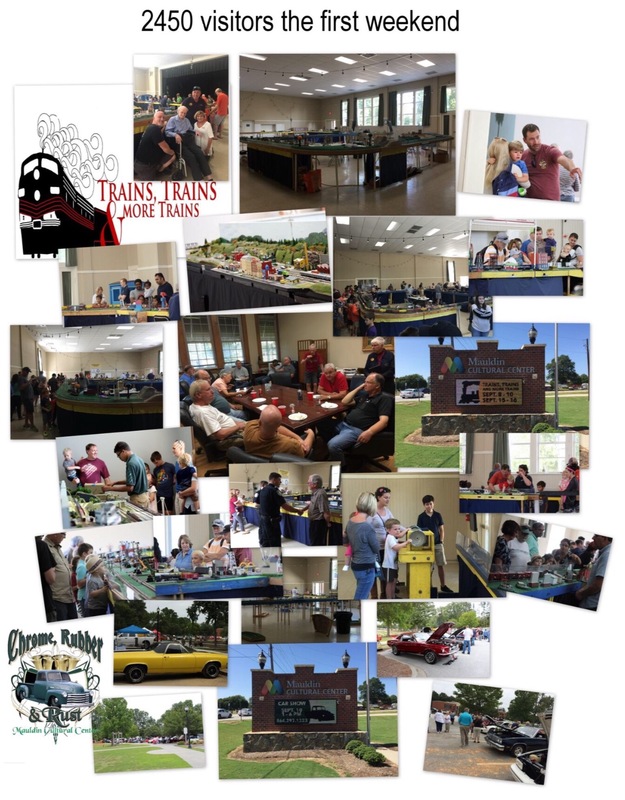 Mauldin makes the list: the "Top 100 Best Places to Live"
Possibly my favorite time of year at the Mauldin Cultural Center - the Train show! Over 4800 visitors total for both weekends! See the Chamber's video. Marriott Courtyard five-story hotel comes to Mauldin! 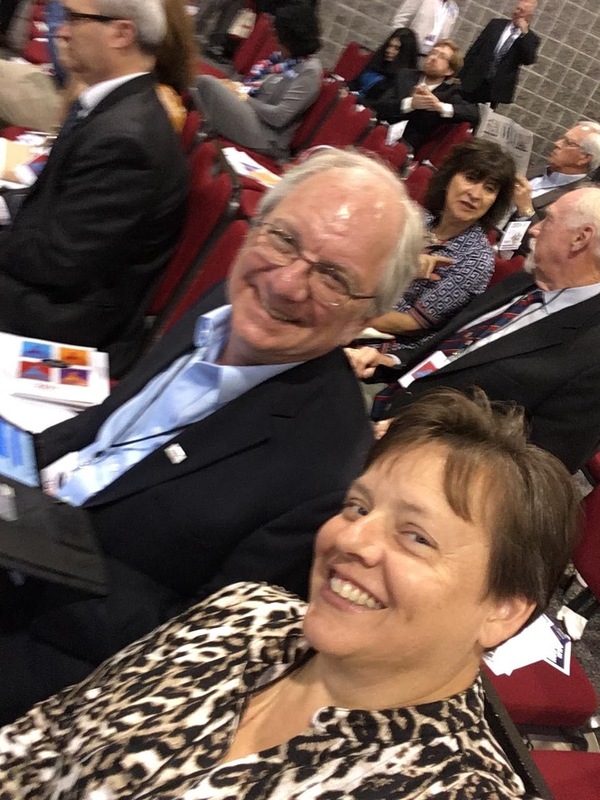 Last week I spent Thursday, Friday, and Saturday at the annual conference held by the Municipal Association of South Carolina (MASC). 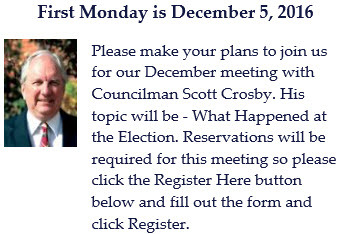 There were a lot of very good classes and talks to help us learn to be better at serving on the City Council. 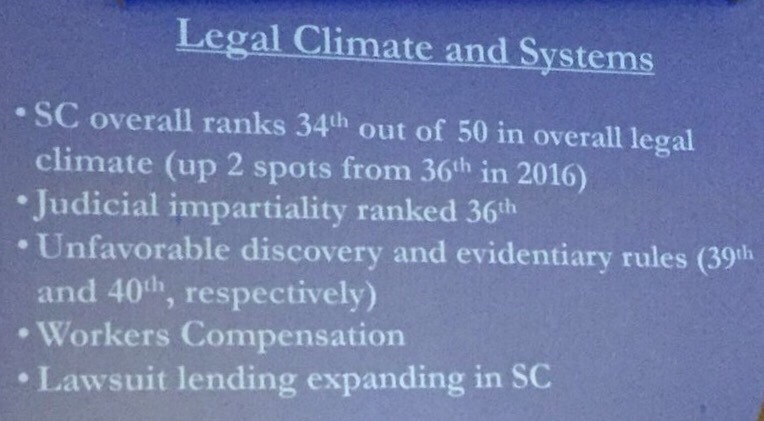 But one really struck home with emphasis: Law Enforcement Challenges, presented by Attorney and former LEO Lance LoRusso. After hearing him speak, I bought copies of two of his books, When Cops Kill, and Blue News. These look like great books and real eye-openers, which I have already started reading. 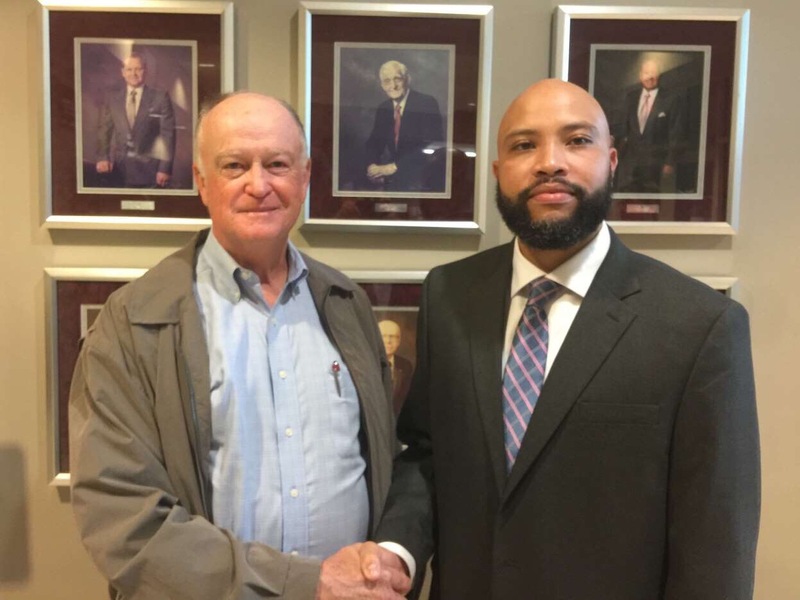 As Mauldin City Council's Chair of its Public Safety Committee, I am learning how important it is to be prepared for the legal issues surrounding the actions of our police force, and also how to act after an incident - particularly with regard to communications with the media and news reporting. Look for more reporting on this and other MASC classes, as I can find the time to write about them. GE presents a check for $5,000 to Mayor Dennis Raines, for new equipment for the Mauldin Fire Department. 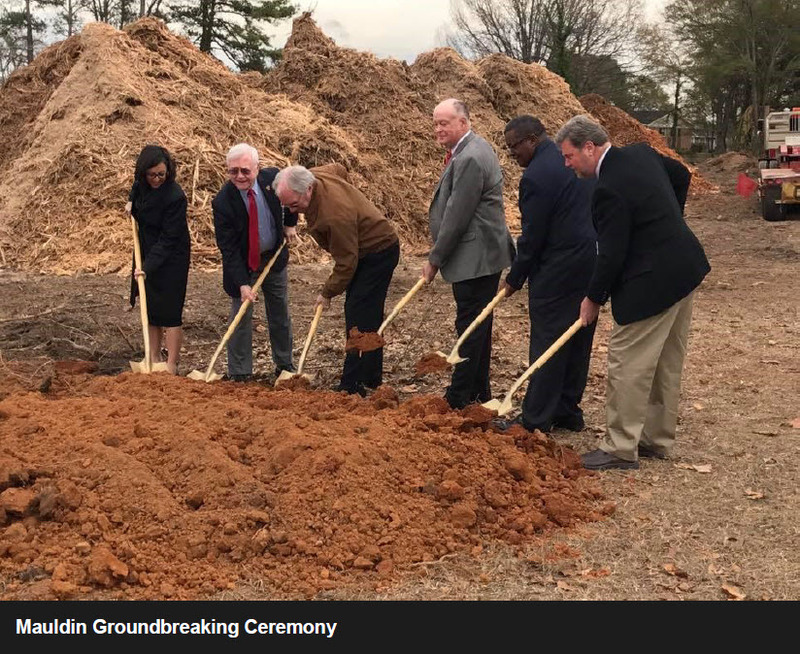 BB&T Corporation (NYSE: BBT) held a groundbreaking ceremony on February 16 for a 140,000-square-foot mortgage servicing center at 825 E. Butler Road in Mauldin, S.C. The new $30 million building will accommodate more than 600 BB&T associates who work primarily in administrative, back office and support functions. BB&T expects to complete construction and move into the facility by the end of the fourth quarter. The mortgage servicing and other operations are currently located at 301 College St. in Greenville. GCRA and the City of Mauldin SC Government were thrilled to celebrate the official kickoff of the site clearance and infrastructure phase for Miller Place Court, which will be the home of 18 units of affordable rental housing at the corner of Miller and Old Mill Roads. 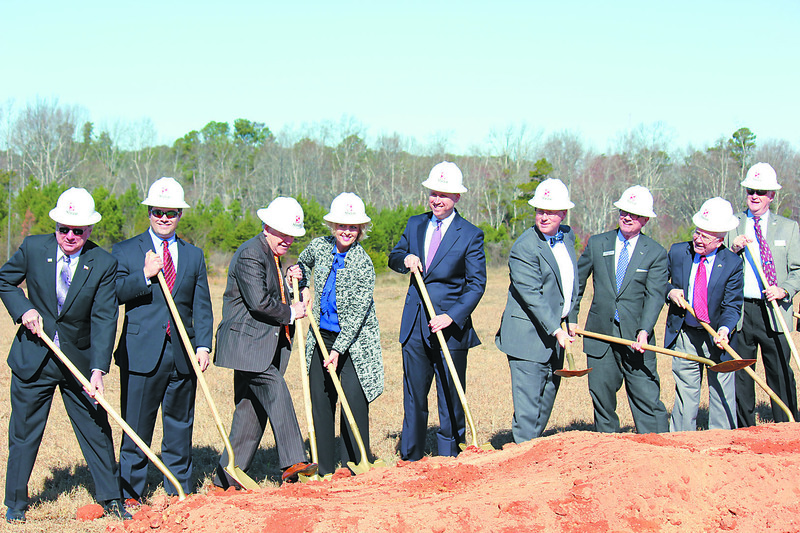 The groundbreaking ceremony, which took place December 15th at the corner of Old Mill and Miller Rds., had over a dozen officials in attendance. 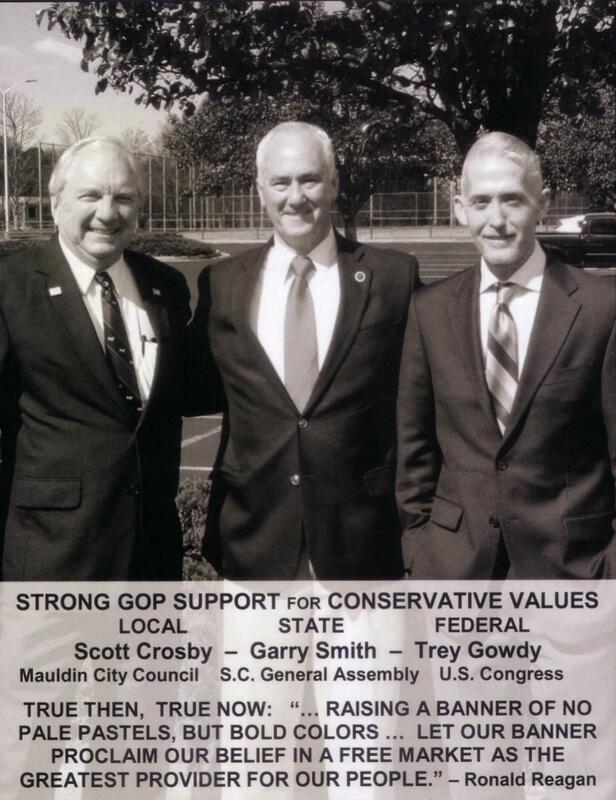 including Mauldin Mayor Dennis Raines and County Council members Fred Payne and Liz Seman, Mauldin City Council member Scott Crosby, and City Administrator Trey Eubanks. The groundbreaking also featured Countybank, as the primary financer of the nine duplex project and special recognition to LS3P Associates Ltd. for the design. The nine duplexes located on over two acres will provide affordable housing for 18 families in a mixed income community. The three bedroom two bath units will range from $600-$800 per month. The next phase for the development is infrastructure improvement, to be completed by Raby Construction and is set to open in 2018. See Scott's speech presentation notes. Scott and Rhoda with the guest speaker, Utah Congressman Jason Chaffetz, Chairman of the House Oversight and Government Reform Committee. 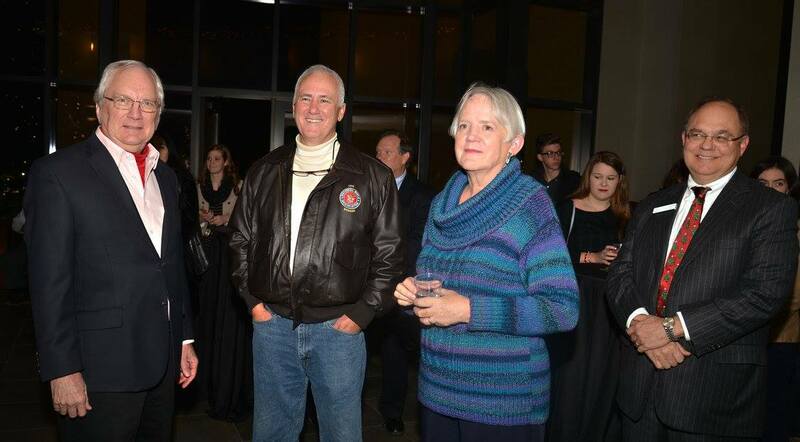 Bud Greer, a volunteer fireman, retiring after fifty years - half a century - of service to Mauldin residents. Eric Lutz, newly promoted to Lieutenant, here shown with his wife, children, and parents. Keeping with tradition, Lieutenant Lutz' son pins on the new rank insignia. 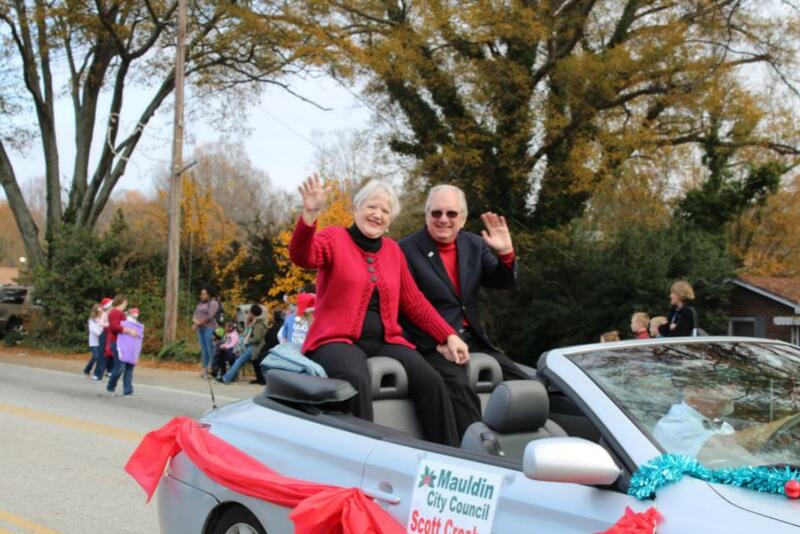 Mauldin's credit rating goes up two levels to Aa2 - just one level below the top! 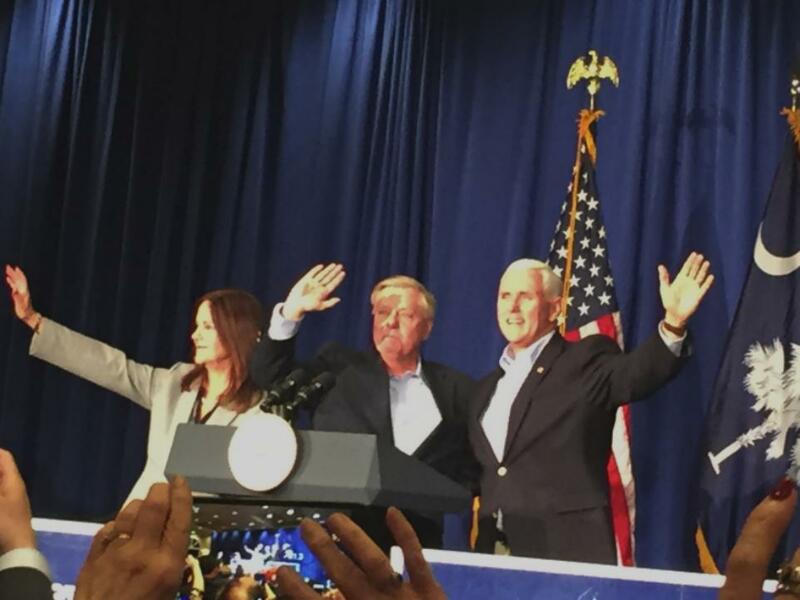 November 3rd, 2015 - Re-elected! Thanks to all of our supporters! My sincere and heartfelt "Thank-you" to those who helped by letting other folks know who I am, where I stand on the issues, and what I have done in my first term as a City Councilman, and thank-you to all those who voted for me! I strongly believe it is my responsibility to work for you as your representative in the City government, and in my first four years I worked with that intent on every issue. That will continue to be my mandate for the next four years. Honorable Politicians and Citizen Politicians . 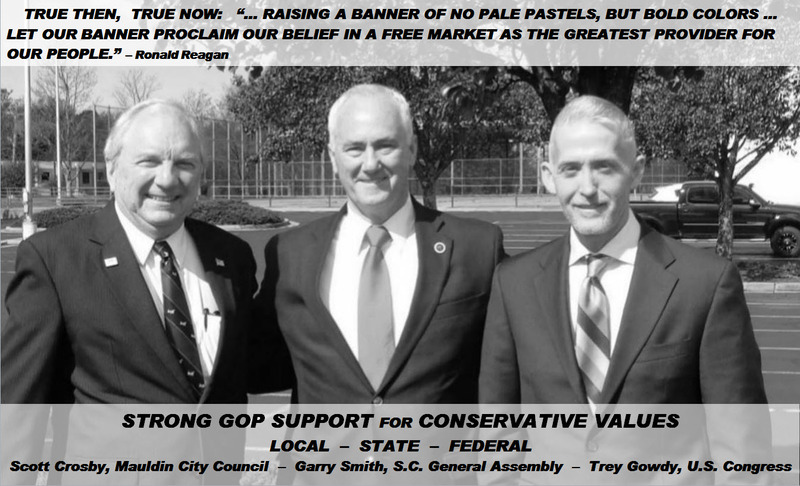 It has been two years since I won election to the Mauldin City Council. A lot has happened. 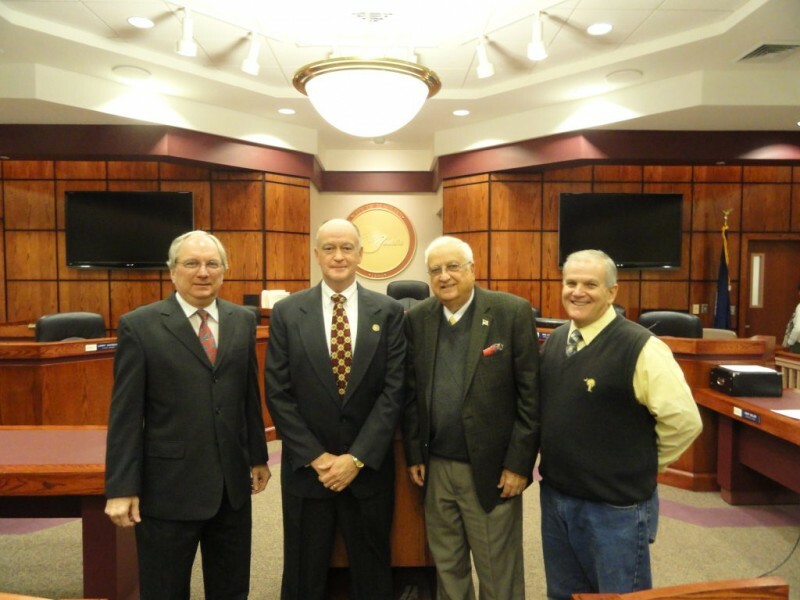 The functions of Mauldin's City government are divided into six areas. Each Councilman is assigned as the Chair of one of six corresponding Council Committees, and is also seated on two other Committees. Assignments are made by the Mayor, with personal preferences noted where possible, and last for two years. I am the Chair of the Building and Zoning Committee. 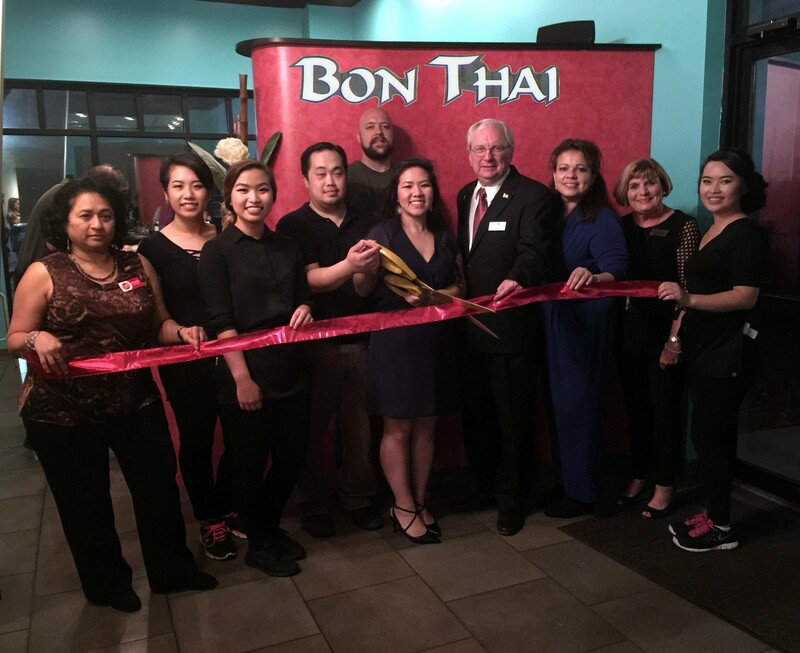 I began my term with the strategic goal of developing a more business-friendly environment in Mauldin, making it more attractive to business growth. 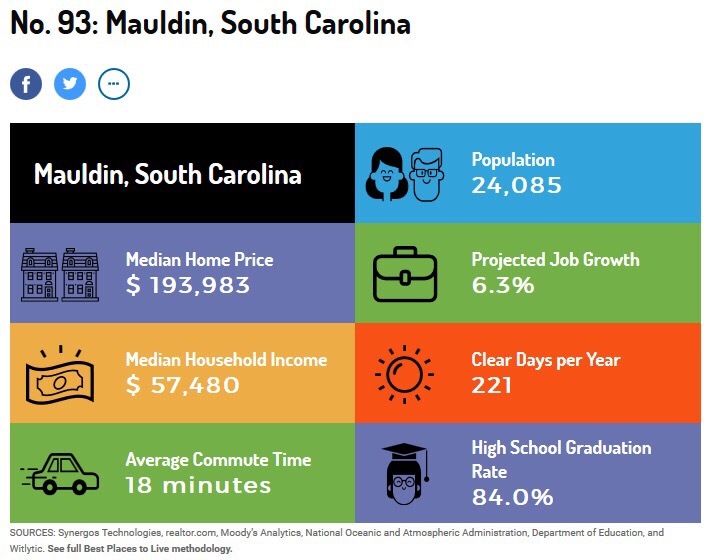 Both smaller and larger neighboring cities are growing and dynamic; it was time for Mauldin to change in that direction as well. Early in my term the Department Director retired. We initiated some changes in the interim, while looking for a new Director. The Building and Zoning Department was renamed Business and Development Services, and we made several other small changes to begin making the Department the City’s “Showroom”, since it is figuratively the first thing in Mauldin that an incoming businessman will visit. Our new Director has really been great at developing this new view of the Department, and businesses have taken notice of the change. Our most recent effort is directed towards cleaning up the sign ordinances, making them easier to understand, more consistent, and more business-friendly. 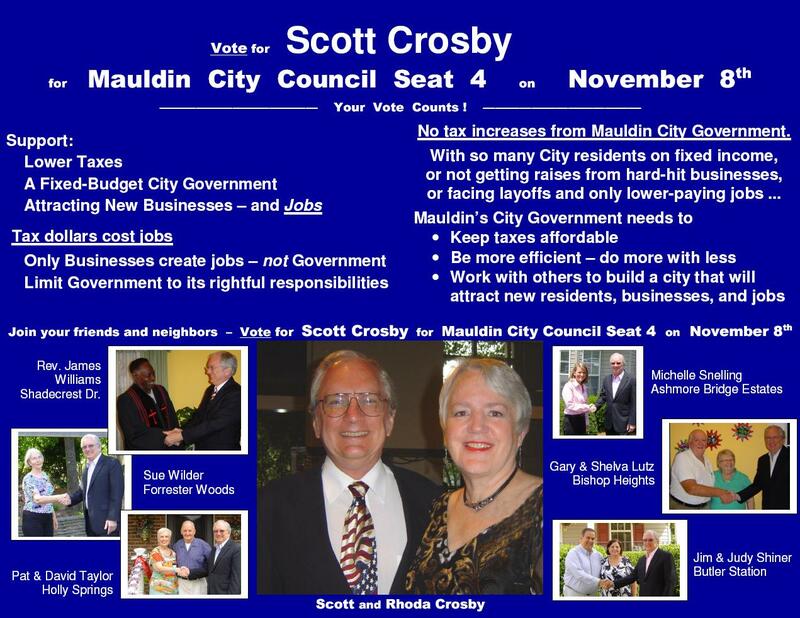 Similarly, as a member of the Economic Development Committee I have worked to attract more businesses into Mauldin. 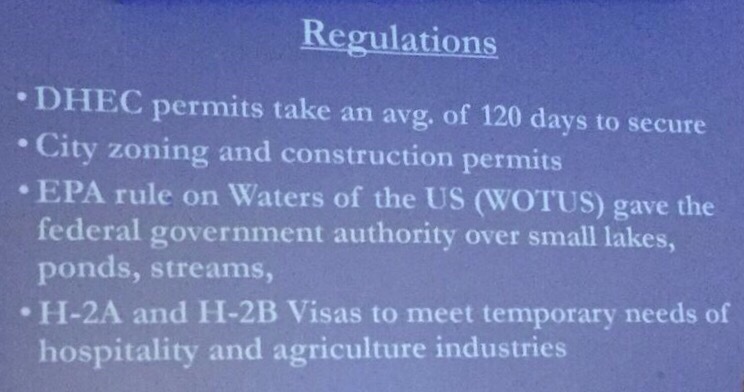 New businesses include start-ups and existing businesses just outside the city limits who ask to be annexed into the City. Mauldin proudly offers response times of less than three minutes from phone call to the arrival of police or fire department personnel; that contrasts to about twenty minutes for those who depend on County resources. 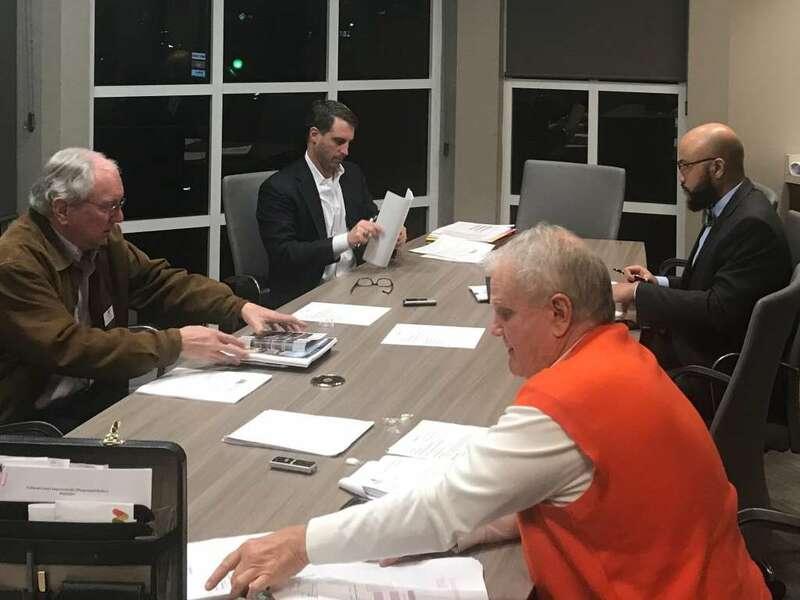 For businesses at locations that can opt for annexation by more than one city, Mauldin offers lower taxes and generally cheaper rates on other services as well. 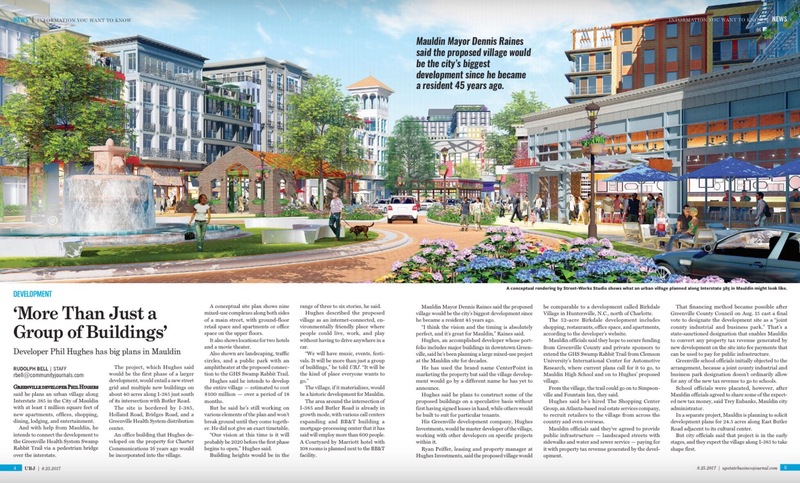 Also as part of that Committee, I have helped to set the strategic, long-term, future development of Mauldin. 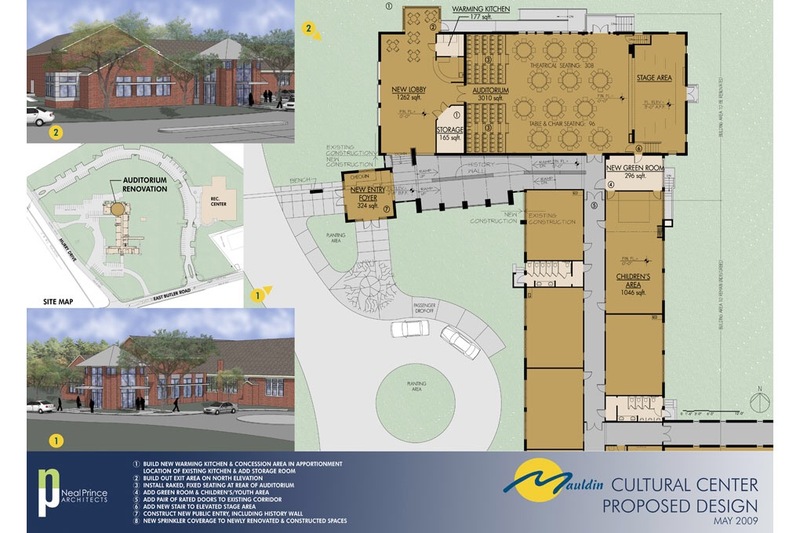 This will hopefully include a more family-friendly town “center”, which we are pursuing through private investment in combination with the City’s investment in supporting infrastructure: i.e., with no tax increases. My third Committee seat is on Budget and Finance. All three Committee members are fiscally very frugal, and have kept a tight budget with no tax increases, while also maintaining city equipment and services. 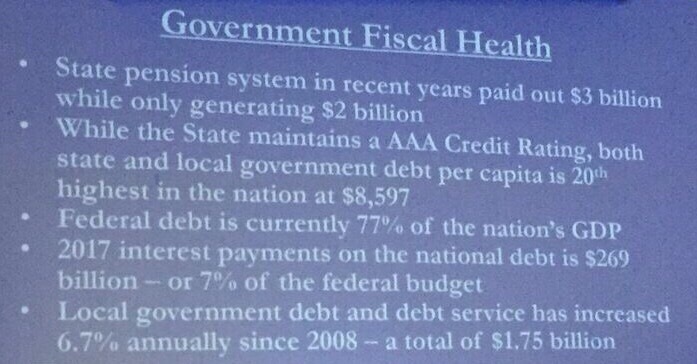 Mauldin has an excellent credit rating, and maintains a fund reserve greater than that required by law. A balanced budget is also required by law, but in both of the past two years we have spent less money than planned, due in no small part to City employees’ careful restraint on expenses. 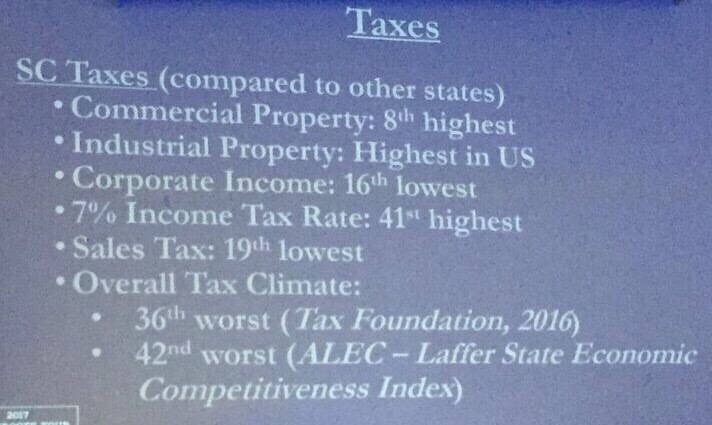 Taxes have not increased in my first two years. The tax situation includes three primary areas where the City can focus its efforts. First, the City has found no need to raise property millage tax rates, or indeed, raise rates for any kinds of taxes at all. The conservative budgeting mentioned previously made this possible. Second, the separate rates for special services have not increased. Unfortunately, this may change for one area in the near future: sewage costs are driven by expanding EPA mandates. 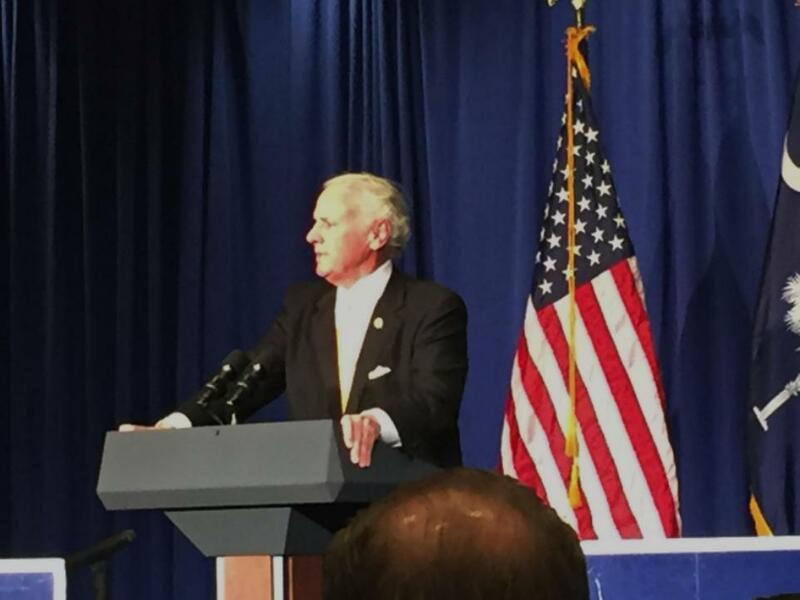 However, even in that regard we are working to minimize any fee increases. Mauldin’s sewage fees are presently the lowest of any of the six cities in the County, as well as the County itself. Even with the estimated increase, Mauldin’s sewage fees will remain the lowest. Also helping to contain costs, Mauldin has been gradually upgrading its sewage system over the past decade, minimizing the need for future maintenance. Several other cities – with fees already exceeding Mauldin’s – face substantial increases to cover the growing maintenance needs of systems that were ignored for too long. Third, the City is working to prevent imposition of higher property millage rates by the County. The County recently inherited an overspent (if not yet bankrupt) budget when it assumed the responsibilities of the County Recreation Commission. 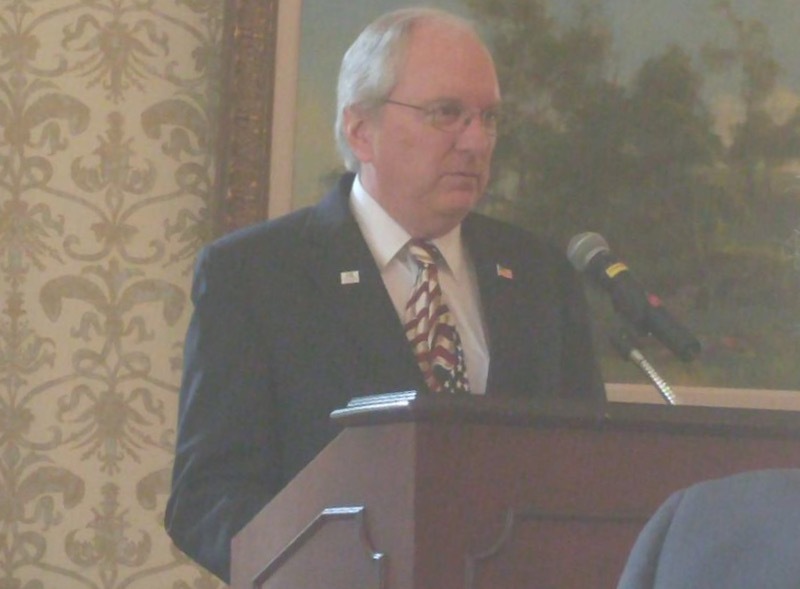 The County’s initial intentions were to raise taxes for residents of Mauldin and three other cities. We are working to resolve this issue amicably and to the benefits of all sides. 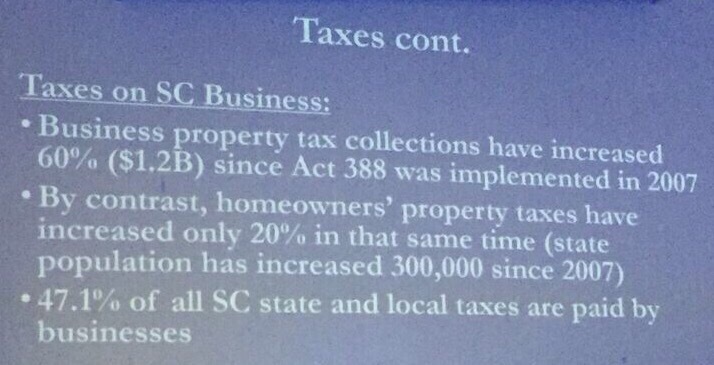 But the County’s proposed taxation appears to be illegal, and litigation remains an unfortunate possibility. Being a successful City Councilman requires working jointly with five other Councilmen and the Mayor. Nothing happens without a majority of votes. The lessons learned from working in such an environment are a prerequisite to success. 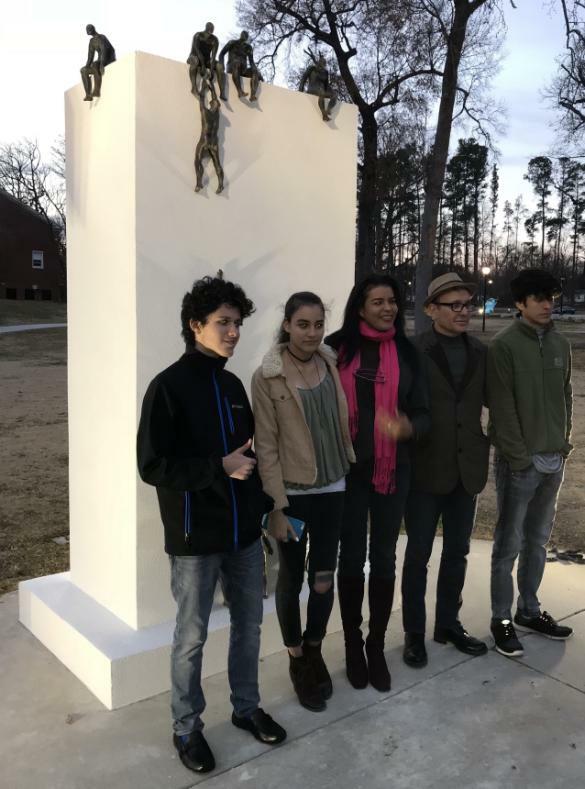 I am pleased with our Council’s accomplishments, the rapport among all seven members of Council, the development of the City of Mauldin in my first two years, and with my contribution to the progress of that development. Thanks to all our supporters -- We won! 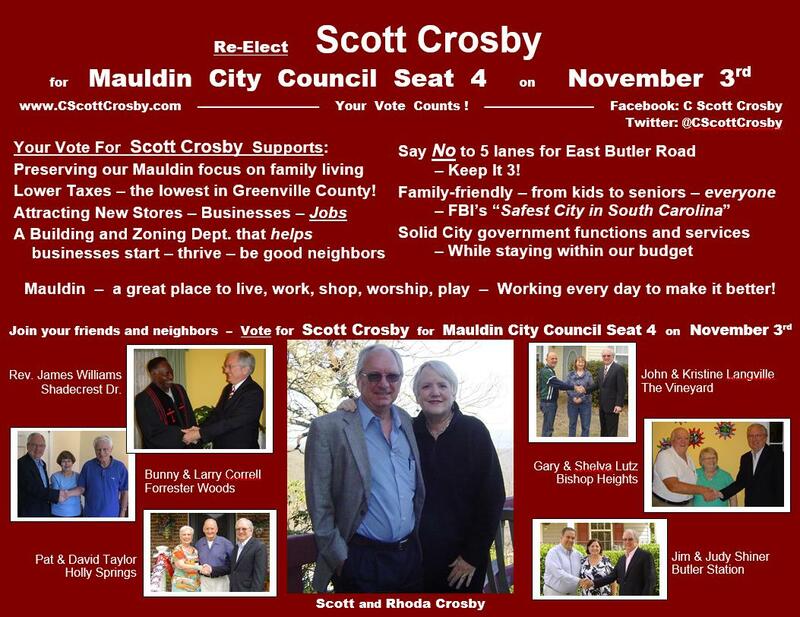 See what was said about candidate Scott Crosby in the links below. "Governmental impositions and controls are destructive and wrong, as evil and as lacking in virtue as the actions of any dictator. Forget chasing backdated options. Brand the anti-capitalist regulators and lawmakers for what they are: guilty of assault on individual success, freedom and America itself, as it was, still is to some degree and ought to be."